In most respects, print books are equivalent to ebooks. Both copies usually have the same content. 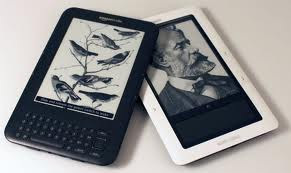 With ereader devices such as Kindle and Nook, both are equally easy to carry around. You can carry more ebooks with you in a smaller space than you can print books. Most ebooks are less expensive. The one area where print books had complete superiority over ebooks was that they could be autographed. I mean, where are you going to sign an ebook? On the back of the Kindle? On the screen? Yesterday I came across a service which I totally dismissed, because I was sure there was a catch. The idea wouldn’t let go of me. It kept me up all night. Early this morning, I checked it out. If there’s a catch, it’s so well buried this cynical author can’t find it. I signed up. It’s called Kindlegraph. It’s a way to collect autographs for ebooks. It’s totally amazing, and now all of my books are able to be signed. My print books have hand-made bookplates which anyone can have for the asking. My ebooks can be signed through the Kindlegraph site. Here are the facts. A Kindlegraph is a PDF file containing the book’s cover image, a personalized note from the author, and their signature. It can be stored on your computer, printed out, or kept in a folder on your ereader. Because it’s a PDF file, most ereaders will display it. You don’t have to own a Kindle. You could even get Kindlegraphs for your print books, print them out, and glue them in the front, if you’d like. You don’t have to own or buy the book to get a Kindlegraph, because no one checks up on you. The Kindlegraph is a separate document; it is not inserted into the book. The author can choose whether to actually sign their name with their mouse, or use a font script. I sign with the mouse, even though it’s a little sloppier than with a pen, because then it is a real autograph. If you tell me you need it signed to a certain person, or you want the inscription to read a certain way, I will personalize the inscription to be the way you want it, just as I would at a book signing. Finally, Kindlegraph and I don’t charge you anything for the service. It is totally free, unless you use Amazon’s Personal Document Service to email it to your Kindle…but that fee goes to Amazon. Requesting a Kindlegraph is easy. Go to www.kindlegraph.com/authors/AM_Jenner, sign in with your twitter account, give them an email address where you want your document sent, locate the book you want signed, and click the request button under the book. I get a daily email informing me when I have requests. I write the personalization and sign it and send it back to you. That’s it! Easy as pie, and finally, a way to autograph an ebook! you mentioned one of the catches. you have to have a twitter account. Oh. I thought I was the last person on Earth to get one...therefore thought "everyone" else already had one. Thanks for finding that catch. Yes, eBooks are equivalent to printed books, but in my opinion, it's not the same thing, because the sensation is different when you keep a book in your hands. However, I don't have nothing against eBooks... I read them often on my tablet, because I travel a lot everyday and it's much smaller and I can have many books on it. All You Can Books can help you find many captivating books for free, but only for a trial period.